Salmon is a wonderful and popular fish which is used almost in every country around the world. There are many ways to cook and enjoy its taste. Whether you eat it raw, grilled or smoked, it is sure to please. The most common question when someone is smoking or grilling this kind of fish, is to notice when it is ready. Preparing sushi with salmon takes much of the guess work out and grilling it is a matter of color to notice when it's ready. But, when it comes to smoking, there are many factors to encompass this fish's cooking time. So, In this article, I am going to show you how long to smoke salmon and how do you properly smoke this delicious fish. The first thing you need to do is collect all the required products and items needed to make this a great culinary adventure. ​Before you start smoking it, you first have to brine and prepare it. Actually, the required time for smoking is determined by the preparing and brining process. If you follow the instructions carefully, your salmon will be smoked faster. First, after you make sure your ﻿fish is clean​, it is time to remove the bones and the skin. We highly suggest to leave the skin on the bottom. You can also remove the tiny bones if you want. A restaurant supply will offer a boning tool, which will make this process easier. These bones are tiny, but easy to remove. On the chance you don’t remove them all, it won’t hurt you to eat a couple. After you clean it and remove the bones, you can apply your favorite rub, and let it set overnight. Today though, we are suggesting our favorite brine marinade. Mix your soy sauce and brown sugar into a bowl and set it aside. Slice your fish into strips of about two inches wide. Take each slice, and place into the bowl of your soy sauce and brown sugar brine. Doing so will ensure that each slice will be coated. From your brine bowl, place each strip into a zipper lock bag. Pack as much into the bag, ideally you will use a bag that can hold every piece. When you are done, pour off the rest of the brine solution into the bag. Seal your concoction and put in the refrigerator. Give your brine at least 12 hours to do its magic, but no more than two days. Quick Kitchen Tip: When you are putting any marinating bag in the refrigerator, place the bag into a bowl larger than the bag. In the event that this tears open, your refrigerator won’t smell like a festering mess. Two are the main things to affect the taste in a more positive manner when you are smoking this kind of fish. The first one is the sweet and savory solution which will keep the fish moist and pleasant tasting, so be patient and let it do its thing. The second is the wood. If you smoke it quickly with a hard wood like mesquite or hickory will leave a strong bitter taste on it. West coast folks may find alder more abundant, while in the south or east, fruit woods con be more plentiful. If you want a nut wood, pecan is very mild. ​A lot of people think that smoking salmon requires cedar wood, right? We don’t agree. We think that grilling on cedar planks is awesome. Soak your cedar plank in a bucket that it can be submerged in for 20 minutes. Turn On your grill at 450°, place the wood on the grill not directly over the fire, and give it a minute. Open and place your salmon on the cedar plank, and monitor. This is a quick smoking recipe, but we don’t enjoy that cedar fast smoke over the slow pecan or alder method. We suggest starting your coal fire in the offset smoker. After about 10 minutes, when the coals are gray, add your smoking wood. You do not want the temperature to go over 200°. Ideally your low temperature is 150°, the high side should be around 175°. As I mentioned earlier, the upper method is more faster but I like more the slow pecan or alder method. Go and retrieve the fish from the refrigerator. Lay out some paper towels on the cutting board to absorb the brine as you remove it from the bag. Once laid out, dab dry the tops of the salmon. Bring them out to your smoker. Lay the salmon strips out on the grill cooking surface. 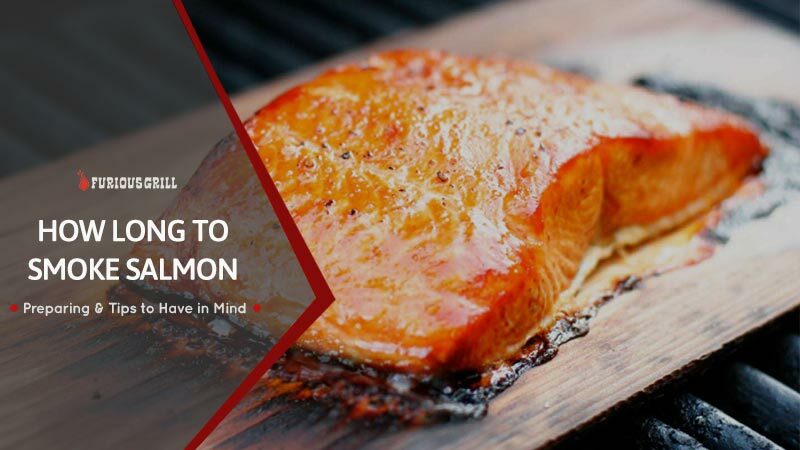 If you think to just lay your tray of salmon on the grill surface or aluminum foil then you are taking a chance, because it will be difficult for the smoke to affect the fish the way it needs to. Now, the biggest challenge when smoking salmon is watching the temperature of your fire and the fish. This is most important, because it dictates how long will the smoke take. Maintain the fire as instructed. It should be ready at 150°, 145° minimum. This should fall between 2-3 hours. Not incredibly hard. Ideally, we suggest that your smoker has a thermometer close to the cooking surface, not close to the fire box, so you can check the temperature. After it is ready, take it off the smoker and get ready to enjoy it. One last important thing to mention is that after you finish smoking and removed it from your smoker, it is recommended to let it sit at room temperature for at least 30 minutes before serving. This is applied to all smoked fishes recipes and techniques, so if you are smoking another kind of fish, make sure to have this tip in mind. Apart the offset smoker method, there is another way to slow cook a salmon: Using an Electric Smoker. An electric smoker does a very fine job and is an easier overall experience. The upside is that you go through each step just as mentioned in the upper section. Turn On your electric smoker and pre-heat it at 175°. You can use wood chips instead of actual wood; Any sporting goods store will carry multiple varieties. Soak the chips for about 15 minutes in water, and reapply more chips every 30 minutes. Most models of electric smokers have a thermometer you can stick in to your meat/fish as it cooks. We don’t suggest this with salmon though. As it smokes, it becomes flakey. You could stand a chance of the thermometer pulling the meat apart. The total needed time, from the preparing it to when you finally pull it off the grill, can take about 15-16 hours. Without the preparing process, the actual cook and smoke time should be close to 3 hours. Even though for some people it seems like it requires a lot of time to be cooked, It is a great investment of time for you, and the rewards are excellent because this fish is one of the most delicious foods you can smoke. Plus, you can enjoy the required cooking time with family and friends. Also, smoking salmon by yourself is definitely more cost effective than buying this entrée outside of your home. I hope you finally found out how long to smoke salmon and also learned some important tips and tricks to make it taste better.